Still stopping smoking from Stoptober? Don’t believe the ‘addiction’ myth! 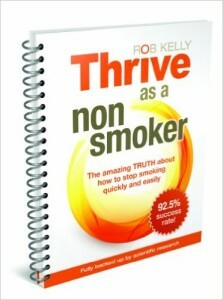 Call 07507 071088 to Thrive as a Non-Smoker and ask me about this extremely effective solution for stopping smoking. The courses are available via Skype or at my practice, and offer surprising insight about the psychology behind smoking, and how simple cognition perpetuates it as a habit: despite most smokers wanting to quit. Find out exactly why it is that you haven’t stopped already, and easily improve your self-efficacy to stop for good. You can do it! The Programme helps to break down your current belief systems about smoking, whereby the key to stopping easily is to realise that you are in control of your thoughts, so then you can better manage your pro-symptom thinking. This short course is NOT therapy; it combines visualisation, positive thinking and proven psychological techniques, and has been created with the sole purpose to help smokers to stop smoking for good. You are almost twice as likely to stop smoking with a Thrive Programme Consultant in just one hour (92.5%), than you are using the NHS’s Stop Smoking Service (48%). The percentage difference in these results is due to the medical profession treating smoking as an ‘addiction’, whereas the Thrive as a Non-Smoker course operates very differently in demystifying what is commonly considered to be addictive (see my Blog for more information on the addiction myth). Once the course is complete, other than just enjoying the obvious immediate benefits of stopping smoking, it is important to positively reinforce your achievement in doing so. In keeping with the Thrive ethos, you will continue to process afterthoughts in an empowering way; exploring your self-efficacy as a ‘non-smoker’ versus ‘ex-smoker’. If you are ready and willing to stop smoking, please book a consultation chat today to find out more about how this course can help you to quit EASILY…. there is no need to lose your marbles over it!